I strongly welcome invitations to teach or give talks. I have spoken on Tolkien and other topics in Britain, the US, France, Germany, Italy and elsewhere. I have taught courses at Oxford, in the US and online. Tolkien and CS Lewis in Oxford, annual one-week course for the Oxford Experience, a residential summer programme hosted by Oxford University in the grand surroundings of Christ Church. 7–11 August 2017; 7–11 August 2018; and (upcoming) 12–17 August 2019. Heroic epic: Tolkien, intensive five-week course for undergraduates and graduates, examining The Lord of the Rings as an adaptation of the heroic epic mode to reflect the modern experience of war. University of Nevada in Las Vegas, July–August 2016. Major figures in British literature: Tolkien, 16-week course for undergraduates about The Silmarillion, The Hobbit, and The Lord of the Rings in their intellectual and historical contexts. University of Nevada in Las Vegas, January–May 2016. Tolkien’s Wars and Middle-earth, 12-week course for students seeking MA credit with the online Mythgard Institute / Signum University. August–December 2015. Repeated August–December 2017 as an ‘anytime audit’ (recorded) course. Tolkien and Oxford, one-week course focusing on his backgrounds in war and academia, for the Oxford University Summer School for Adults, with Dr Maria Artamonova. 2–9 August 2014. Tolkien’s Atlantis myth of Númenor, Taruithorn (Oxford Tolkien Society), 23 January 2019. Tolkien’s creation myth, Oxford C.S. Lewis Society, 22 January 2019. Talk to University of Maryland students in Oxford, 21 January 2019. Talk at the British Library event Tolkien’s World, 16 November 2018, together with artist Alan Lee and Oxford English lecturer Mark Atherton, in celebration of Middle-earth’s Anglo-Saxon connections. Atlantis and Mars: New Light on Tolkien, Lewis, and their Science-Fiction Pact – keynote talk to the Tolkien Society’s Oxonmoot gathering, St Antony’s College, Oxford, 22 September 2018. Previously presented to the Oxford CS Lewis Society, 17 January 2017. Keynote talk, Ilu’s Music: The creation of Tolkien’s Creation myth, at the Fantasy, Science Fiction and Literary World-building conference and Tolkien Seminar, Augsburg University, Germany, 28 October 2017 (left). The Weston Library, Oxford, on 8 September 2018 as part of the co-events to the Bodleian’s Tolkien exhibition. You can watch that here (until 28 October only). ‘The likeness of Lúthien: How Britain and Edith Tolkien are reflected in Middle-earth’, at Estelcon, the Spanish Tolkien Society’s convention at Tortosa, Catalonia, 13–14 October 2017. Talks in Oslo at ArtheCon, annual convention of Arthedain, the Tolkien Society of Norway, about the revenant dead of The Lord of the Rings and the invention of Númenor, 25–26 March 2017. Reading from the letters of Tolkien's friend Rob Gilson in a commemoration of his battalion, The Maltings, Ely, 8 December 2016. Talk, ‘The Great Wave: Tolkien’s Atlantis myth, the 1930s crisis of civilisation, and the bridge to The Lord of the Rings’, at the Tolkien Day symposium hosted by Liverpool Hope University, 11 November 2016. Double-length talk, ‘Revenants: How the ghosts of World War One returned to haunt The Lord of the Rings’, at the annual conference of Seryn Ennor, the Swiss Tolkien Society, hosted by the Greisinger Museum in Jenins, 3 September 2016. Talk on Tolkien, writing and publication, to the Henderson Writers’ Group, Las Vegas, 25 July 2016. Talk on Tolkien’s ghosts, followed by book signing, at the National World War 1 museum, Kansas City, Missouri, 16 July 2016. Tolkien talk and discussion, Writer’s Block bookshop, Fremont Street, Las Vegas, 16 February 2016 (right). Talk on research as Black Mountain Institute Fellow in Humanistic Studies, International Education Week at the University of Nevada in Las Vegas, 17 November 2015. ‘“Quickened to full life by war”: A fresh look at why Tolkien fell for Faërie’ — talk at the Tolkien Society Seminar 2015, Leeds, 3 July 2015. Tolkien talk for the Brigham Young University London Centre, LDS Church, London, 9 April 2015. Talk on Tolkien and the First World War, the Tenth Annual Joan Coffey Symposium, Sam Houston State University, Texas, 25 March 2015. ‘Tolkien and the Great War’, Hudson Library and Historical Society, Ohio, 3 March 2015. ‘Tolkien on the brink of Middle-earth 100 years ago’, Regent’s Park College, Oxford, 27 February 2015. Tolkien’s Dead Marshes, at Great War and Modern Imagination Conference, Beverley, East Yorkshire. 26 November 2014. Live Q&A, Compiègne’s Bibliothèque Saint-Corneille, as part of exhibition, Tolkien et la Grande Guerre, le fondement d'une mythe. 15 November 2014. Reading from the letters of Robert Quilter Gilson, TCBS, as part of the centenary Remembrance Sunday events at his alma mater, Trinity College, Cambridge. 9 November 2014. Talk on ‘Tolkien und der Erste Weltkrieg’ at the Militär Historisches Museum in Dresden, 2 November 2014. The capacity crowd has only been topped twice, by a foreign minister and a film star. I talked with four Oxford Anglo-Saxon professors in ‘Tolkien’s Beowulf: A Roundtable’, a Medieval English Research Seminar with the Faculty of English at Oxford University. 22 October 2014. Talk on Tolkien to Western Front Association (Herts and Beds branch), Harpenden. 10 October 2014. Illustrated biographical talk, ‘The Breaking of Tolkien's First Fellowship’, opening a weekend of Great War commemorations in Marston Green, Warwickshire (former home of the Gilson family), 1 August 2014. Talk on Tolkien to the University of Alabama’s Oxford summer school, Worcester College, 23 July 2014. Guest of honour at Tolkien Thing, the annual gathering of the German Tolkien Society, at Castle Breuberg in Hesse, 18–20 July 2014. Exeter College, Oxford, 30 April 2014: ‘Rector's Seminar’ on Tolkien as an undergraduate. Exeter College, Founder’s Day Weekend, 6 April 2014: Tolkien at Exeter College. Exeter College annual City Lecture, Freshfields, Fleet Street, 25 February 2014: Tolkien at Exeter College. Oxford Tolkien Society, Christ Church, 8 November 2013: On Tolkien, the Great War, and Frodo. Oxford C.S. Lewis Society, Pusey House, 22 October 2013: ‘Deaths, beliefs and griefs observed: C.S. Lewis, Aldous Huxley and JFK, died 22 November 1963’. Now available in full at the Daily Beast. National Army Museum, 17 October 2013: ‘Shadow of the past: Memories of the Somme in Tolkien’s Middle-earth’ (right). British Studies at Oxford summer school, St John’s College, 29 July 2013, on the Dead Marshes and the Somme. Oxford Tolkien Spring School, Oxford University, 21 March 2013: ‘Tolkien’s life’. Oxford University C.S. Lewis Society, Pusey House, 19 February 2013 and 8 June 2010, on the Dead Marshes and the Somme. National World War I Museum, Kansas City, Missouri, U.S.A., 30 September 2012 (via live video feed). 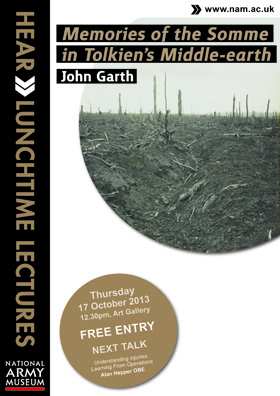 ‘Talking Tolkien: From the Somme to the Shire’. Return of the Ring conference, Loughborough University, 19 August 2012: ‘Robert Quilter Gilson, TCBS: A brief life in letters’. Hungarian Tolkien Society conference in Budapest, 16 June 2012. 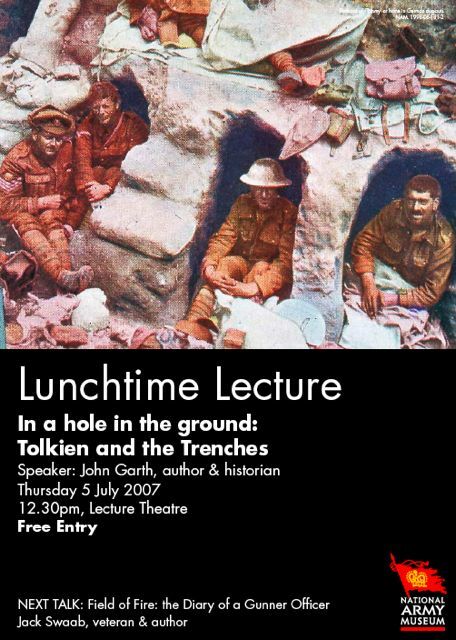 ‘In a hole in the ground: Tolkien in the trenches’. Festival in the Shire, Pontrhydfendigaid, Wales, 15 August 2010. On Rob Gilson. Penkridge Library, Staffordshire, 10 July 2009. National Army Museum, London, 5 July 2007 (right). Tolkien 2005 conference, Aston University, Birmingham, 13 August 2005. The Lord of the Rings, 1954–2004: Scholarship in Honor of Richard E. Blackwelder, conference at Marquette University, Milwaukee, 21 October 2004. ‘Frodo and the Great War’. See here for one discussion of my paper. Tolkien e la Terra di Mezzo conference, Italian Tolkien Society, Brescia, Italy, 21 March 2004. Tolkien Society annual general meeting, the White Hart Hotel, Lincoln, 24 April 2004. Rice University, Houston, Texas (Medieval Studies Workshop, Center for the Study of Cultures) 6 February 2004. Oxford Tolkien Society, Christ Church College, 21 November 2003. Eltham College, London, 29 November 2002. Oxonmoot (annual Tolkien Society gathering) at St Anthony’s College, Oxford, on 22 September 2001 and 19 September 2003. Cambridge Tolkien Society, 13 March 2001. I have been a panellist in discussions on researching Tolkien at the Return of the Ring conference, 19 August 2012 (with Janet Brennan Croft, Verlyn Flieger and Robert S. Blackham), and on Tolkien and war at Oxonmoot, 20 September 2003 (with Jane Chance, Colin Duriez and Ted Sherman) and at the Tolkien 2005 conference, 12 August 2005 (with Tom Shippey).